BY PATRICK WATSON : Health care is now a huge, thorny political and economic issue, and the chart below shows one reason why. The US spends far more on health care than other developed nations, with worse outcomes by many measures. Yet, all that money doesn’t just disappear. 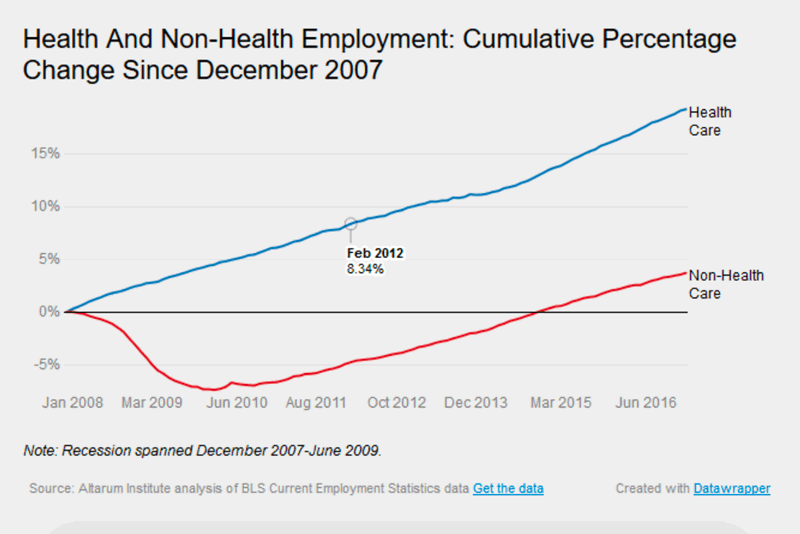 Health care is a huge industry that accounts for most of the nation’s post-recession job growth. According to Kaiser, labor is more than half of the $3.4 trillion spent on health care. A good part of it has little to do with patient care. For every physician, there are 16 other healthcare workers. Half of them are in roles like data entry and billing. The spending that some of us might call “waste” partially supports someone else’s paycheck. That doesn’t make it untouchable. But eliminating healthcare jobs simply trades one problem for another if there aren’t other jobs for the affected workers.